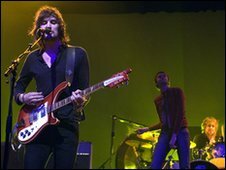 MySpace has launched a UK version of MySpace Music in a bid to compete directly with streaming sites like Spotify and Last Fm. The site, which helped launch the careers of Lily Allen and Kate Nash, claims it has "the most comprehensive catalogue" on the internet. Teaming up with Apple iTunes it will enable DRM-free downloading. It will offer free streaming access to entire back catalogues of artists on both major and independent labels. MySpace Music, which has 13 million UK accounts, is known as a platform for up-and-coming bands. Speaking to BBC 6 Music, Courtney Holt, president of MySpace Music, described the new look MySpace as a "social music discovery service". "We provide streaming audio, video, a comprehensive suite of artist tools, original content and programming all wrapped up together in one nice package," he explained. Like Spotify, occasional adverts will appear on-screen, but unlike the other free service, the adverts will not interrupt the music which is being streamed. Holt explained why it has taken some time for the innovations to take place: "Part of it was the need to evolve the tools and we've done a really good job at that, creating a great user experience." Kasabian played an intimate gig in London on 2 December to mark the launch of the site, which is run by a subsidiary of News Corporation after its owner was bought out in 2005 for more than £300m. Artists will be able to publish playlists to so fans and friends can see what is influencing them. Celebrities Britney Spears, Lady GaGa, Katie Price and even the Vatican have offered up their playlists. Holt has high hopes for MySpace Music in the UK, adding: "MySpace Music is the number one music site in America and since we have launched in Australia and New Zealand we have seen double the engagement than pre, so we believe this is going to be great for MySpace in the UK." Have Your Say: How do you listen to your music?